The leading players in the Asia Pacific commercial refrigerators market are looking to expand their product portfolio in order to keep pace with the prevailing competition. The market is characterized by the presence of a large number of international and domestic players that are vying for large shares in China, India, Thailand, and South Korea, finds Transparency Market Research (TMR) in a new study. Haier Electronic Group Co. Ltd. and Midea Group are the leading companies in the Asia Pacific commercial refrigerators market. The competition in this market is anticipated to grow sharper over time as manufacturers are increasingly focusing on enhancing customer experience and product innovation. “Improvements in retail channels and purchasing power of consumers hold the key to sustainable growth for companies operating in this market,” says the author of the report. 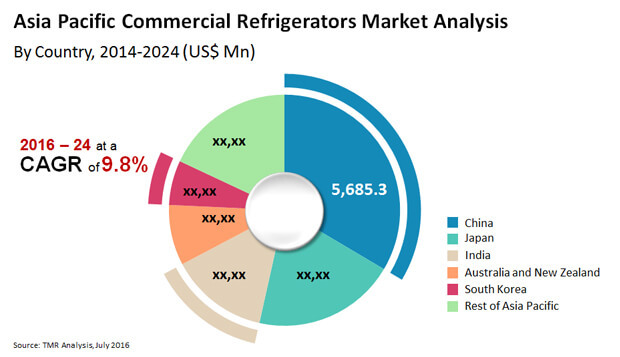 The Asia Pacific commercial refrigerators market is poised to rise at a CAGR of 9.8% between 2016 and 2024, reaching a value of US$38.83 bn by 2024 from US$16.99 bn in 2015. On the basis of beverage refrigerator type, the market is segmented into beverage refrigerator and wine refrigerator. The beverage refrigerator segment dominated the market in terms of revenue in 2015, holding a 57.2% share in the overall market. The booming tourism sector is propelling sales of beverage refrigerators. However, due to increasing alcohol consumption in Philippines, the segment is anticipated to lose its market share to wine refrigerators. Geographically, China will continue to be the leading revenue contributor in the market until 2024. The availability of commercial refrigerators at a low price due to the presence of both local and international manufacturers is fuelling the growth of the region at a 7.3% CAGR during the same period. Furthermore, the increasing foreign direct investment in the food retail sector is providing a significant push to the China commercial refrigerators market. The flourishing growth of the food and retail sectors in Asia Pacific is propelling the demand for refrigerators with innovative designs. The increasing population of working women, rising expenditure on convenience food, and hectic lifestyles of consumers are driving the demand for packaged food and beverages. This, in turn, is contributing to the growth of the Asia Pacific commercial refrigerators market. “The increasing number of grocery stores, cafes, restaurants, and supermarkets is boosting the sales of commercial refrigerators in the region,” says a TMR analyst. Another factor bolstering the growth of the market is the rising awareness about energy-efficient green appliances that has paved way for the development of eco-friendly commercial refrigerators. Despite all favorable factors, the high cost of procurement and maintenance of commercial refrigerators is hampering the growth of the market. This is limiting the sales of these refrigerators to large retailers as small retailers tend to opt for more affordable alternatives. Moreover, the presence of alternate packaging solutions including temperature-controlled packaging is impeding the large-scale adoption of commercial refrigerators in Asia Pacific. On the other hand, the advent of smart and solar powered commercial refrigerators is providing considerable growth potential to the market. With a large number of enterprises developing and manufacturing solar-based commercial refrigerators, the market is likely to gain consequential momentum in the forthcoming years. 5 Cu. Ft. to 3.0 Cu. Ft.
1 Cu. Ft. to 6.0 Cu. Ft.
1 Cu. Ft. to 9.0 Cu. Ft.